Rebreathers have become an arrow in the quiver of leading Australian cave divers to push the boundaries of Australian cave systems. In this article some of Australia's leading cave and rebreather divers compare and contrast some of the rebreather technology currently available for cave diving. This review of the APD, Halcyon, KISS, Megladon and Mk15.5 rebreathers has now been updated with the addition of four more models: Optima, Poseidon, rEvo, Sentinel. Ambient Pressure Diving currently have a range of four units: the older first generation Inspiration Classic and the Vision family of second generation units, the Inspiration, the Evolution and the Evolution Plus. The classic is still available but is nowhere as popular as the newer second generation Vision units which have the lion's share of the CCR (closed circuit rebreather) market. The Vision family of units have a built-in on board computer that handles the general running of the unit's electronics' and the decompression profile of the dive. These were the very first second generation units to market and as such still hold a substantial lead over other second generation units in the use of computer systems to control the unit during a dive. Light unit(s) at only 27kg for an Inspiration and 23kg for an Evolution. Selectable Gradient Factors for the computer with a floating deco point until final stop ceiling is reached. Very low Work Of Breathing (WOB). Temperature Stick available to monitor the scrubber duration/usage. Not a overly large scrubber at 2.5kg though this will give a 3 hour duration dive in 4 degree C water with the divers breathing rate at around 20 litres per minute. Over the shoulder counter lungs can be seen as an disadvantage but does give the absolute optimum counter lung position. For the cave and open water diver, this is a nice unit. It is compact enough for most cave diving and hardy enough for any conditions. The handsets are easy to use. However, the biggest reason I chose the Optima was for the scrubber that it uses. The easy to install Micropore solid canister takes about 20 seconds to put into the unit! The fact that it is solid and not granular has some huge advantages. It take away the human error side of packing a canister properly, channeling is impossible and if flooded, there is no possibility of a caustic cocktail. Having a CO2 problem on a CCR is one of the biggest hazards of diving the unit. If you can avoid some of the issues that can cause a CO2 problem, the Micropore canister becomes quite an attractive option. The RB 80 was named after the designer Reinhard Buchaly (RB) and 80 after the similarity of the size of the unit to an 80cft cylinder The first prototypes of the RB80 were produced in 1999. The unit became commercially available through Halcyon manufacturing in 2001. To date there have been no fatalities on the unit emphasising its simplistic and safe passive semi closed circuit design. The unit is not constant flow like other common SCR's (semi-closed circuit rebreathers). The bellows has a ratio of 1:10. Effectively for every breath, 1/10th of the gas is dumped off board by the inner bellows mechanism through an OPV (over pressure valve). Subsequently as the gas in the bellows is breathed and passively ejected, the plate at the bottom of the "compressing" bellows eventually hits 2 independent second stage injectors which refresh the bellows with fresh premixed drive gas. This injection is easily heard and monitored by a diver and the gas ejection bubbles are visible to an attentive dive buddy. The counter lung is protected and at the bottom enabling a better WOB (work of breathing). The Classic KISS was one of the earliest fully "manual" CCRs developed. The basic principle of operation relies on the mechanical injection of oxygen into the breathing loop, whilst the PO2 (partial pressure of oxygen) is monitored by the diver. A continuous trickle of O2 into the loop through a fixed orifice ensures that the PO2 in the loop is always slowly declining. This means that the diver must be very vigilant in watching their PO2 and intermittently top it up with a manual addition button. If the rebreather is set up correctly, this extra addition can be quite infrequent at constant depth. 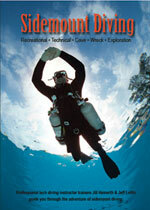 Inherent safety of manual CCR - a vigilant CCR diver = a safe CCR diver! The Megalodon is an electronically controlled, closed circuit rebreather, using the most common design of central can housing the scrubber and electronics, flanked by the cylinders and with over the shoulder, or (optionally) "around-the-neck" counter lungs. Diver interface is via twin, redundant handsets for controlling and monitoring the electronics plus a head-up display. modular design and construction offering a high degree of flexibility, enabling the following components to be quickly and easily changed for various manufacturer-offered or after market components to suit the individual requirements of the dive: electronics, counter lungs, cylinders, scrubber (radial or axial, various sizes/durations), harness and backplate. It can even be used in side mounted or twin rebreather configurations. standard over-the-shoulder counter lungs clutter the chest as usual with rebreathers using this design. Approximately 85 of these prototype rebreathers were made by the US Navy in the 1980's, and as such they are not truly a commercially available unit. However most are still in use and if you really want one, they can be picked up second hand. Arguably the most thoroughly tested and most rigorously designed unit available (not many private companies have the resources of the USN! ), the 15.5 has proven itself in extreme diving applications (depth, distance, duration). A recreational unit designed for divers who do not want to be technically challenged. It is simple to use and for no decompression diving, it is designed to facilitate you in the simplest possible way out of a problem the unit might have. Pretty much, if you have an issue, BAILOUT. The BOV is simple to operate. There is only one handset to look at and it does not need to be programmed, no setpoints are inputted by the diver. Ideal unit for the 40m max no deco diver that wants to spend heaps of time worrying about the composition and setting up of their photographic master piece, and less time worrying about how to fly the unit. The compact nature of this unit is the main reason for choosing this CCR. As an avid cave diver, this units slimline design and compactness appealed to me the most. It is a great all-round unit but I believe that it's capabilities in the cave environment far exceed other units on the market. It also has a unique scrubber system that is designed to cater for safety. There are two scrubbers so that if one is compromised, the other acts as a safe guard and continues to scrub the CO2. The counterlungs on this unit are also built in to the back of the unit making them more protected and more streamlined. Unique scrubber system which allows a more efficient use of scrubber material. Also available with long duration radial scrubber. What a work of art this machine is. The technology that has gone into this beast is awesome to say the least. However, the reason I chose this unit was not for cave diving, well not tighter caves anyway. It is a much larger unit. great for the big long passages of Cocklebiddy, not so great for the tighter passages of Tank Cave. This unit caught my eye because is is a good deep ocean exploration unit. One thing that sets it apart from the others that it has a unique infrared CO2 detector on it. This in itself is one of the most sort after feature on a CCR. The fact that it does not have cables in it but most of it's systems are connected via infrared or fibre optics is a huge advantage as well when you consider that metal does not work well in moist environments. A true life support system, you will also pay a bit more for this unit.